Some have raised concerns that the words “for many” limit the universal scope of Jesus’ saving mission. They hold that the revision implies that Jesus did not die on the cross for everyone—that he offered his blood on Calvary not “for all” but just for a select group of people, “for many.” This is a misunderstanding of the text. First, we should happily note that the new translation renders more exactly Jesus’ words at the Last Supper. There our Lord said that His blood was shed “for many” (see Matthew 26:28). 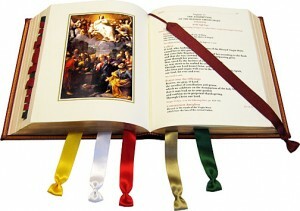 It is also more harmonious with the Latin text of the Mass, as has been used for centuries. Above and beyond all else, the new translation points to the grievous reality that, although Jesus died for all, not everyone chooses to accept the gift of salvation. Every individual must choose, with the aid of the Holy Spirit, to embrace salvation in Christ and live according to God’s grace, and so be counted among “the many,” the holy elect. This must not be understood as contradicting the plain reality and ancient dogma of the Church that Jesus died “for all” (1 Timothy 2:6). Other prophecies in Isaiah concerning the Servant of the Lord make clear the universal scope of His mission: He is the One that announces salvation to all humanity (cf. Isaiah 42:1-10, 49:6, 52:10). In this context, the expression “the many” can be seen as contrasting the One person Who dies—the Suffering Servant (our Lord Jesus Christ)—with the multitude who benefit from His atoning sacrifice. The choice to use “chalice” instead of “cup” reflects a formalized rendering of the Latin text. It underscores the solemn and sacred qualities of the liturgy. It also reminds worshipers that the bread and wine are no ordinary meal, but the Body and Blood of the Lord, offered in holy vessels set aside from daily use. As a church musician, I’ve been preparing for these changes for months. As a faithful Catholic, I’m looking forward to a more precise translation from the Latin. Praise God for giving us Holy Mother Church who has seen that we need this new English translation.